76 LONGISLANDPRESS.COM • JULY 2018 PRESS BUZZ: COMMUNITY THEATER UPCOMING MUSIC & THEATRE PRODUCTIONS THE PRINCESS WHO SAVED A DRAGON Celebrate being different in this whimsical story where a princess rescues a dragon! A fun musical for the entire family! Theatre Three, 412 Main St., Port Jefferson. theatrethree.com, 631-928- 9100. $10. July 6-Aug. 9. PINKALICIOUS THE MUSICAL Based on the popular book by Victoria Kann and Elizabeth Kann, Pinkalicious is a sweet tale of a little girl whose obsession with eating pink cupcakes lands her at the doctor’s office The Blues Best Kept Secret. 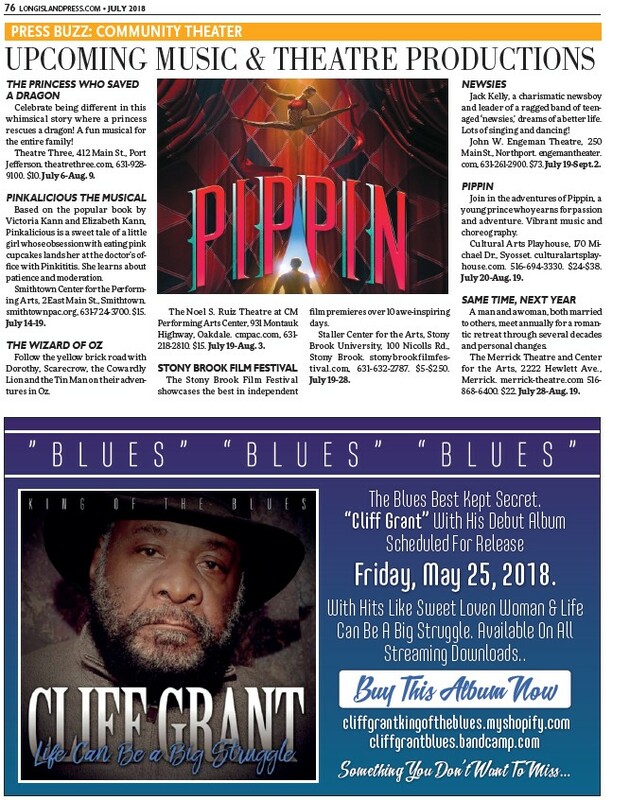 “Cliff Grant” With His Debut Album Scheduled For Release Friday, May 25, 2018. With Hits Like Sweet Loven Woman & Life Can Be A Big Struggle. Available On All Streaming Downloads.. Buy This Album Now cliffgrantkingoftheblues.myshopify.com cliffgrantblues.bandcamp.com Something You Don’t Want To Miss… with Pinkititis. She learns about patience and moderation. Smithtown Center for the Performing Arts, 2 East Main St., Smithtown. smithtownpac.org, 631-724-3700. $15. July 14-19. THE WIZARD OF OZ Follow the yellow brick road with Dorothy, Scarecrow, the Cowardly Lion and the Tin Man on their adventures in Oz. The Noel S. Ruiz Theatre at CM Performing Arts Center, 931 Montauk Highway, Oakdale. cmpac.com, 631- 218-2810. $15. July 19-Aug. 3. STONY BROOK FILM FESTIVAL The Stony Brook Film Festival showcases the best in independent film premieres over 10 awe-inspiring days. Staller Center for the Arts, Stony Brook University, 100 Nicolls Rd., Stony Brook. stonybrookfilmfestival. com, 631-632-2787. $5-$250. July 19-28. NEWSIES Jack Kelly, a charismatic newsboy and leader of a ragged band of teenaged ‘newsies,’ dreams of a better life. Lots of singing and dancing! John W. Engeman Theatre, 250 Main St., Northport. engemantheater. com, 631-261-2900. $73. July 19-Sept. 2. PIPPIN Join in the adventures of Pippin, a young prince who yearns for passion and adventure. Vibrant music and choreography. Cultural Arts Playhouse, 170 Michael Dr., Syosset. culturalartsplayhouse. com. 516-694-3330. $24-$38. July 20-Aug. 19. SAME TIME, NEXT YEAR A man and a woman, both married to others, meet annually for a romantic retreat through several decades and personal changes. The Merrick Theatre and Center for the Arts, 2222 Hewlett Ave., Merrick. merrick-theatre.com 516- 868-6400. $22. July 28-Aug. 19.